Origin and Habitat: All species of this genus are endemic to Brazil. Habitat and ecology: Cryptanthus in their natural habitat are true terrestrials (growing in the ground) and a few are saxicolous (growing among rocks). They have never been observed as epiphytes. 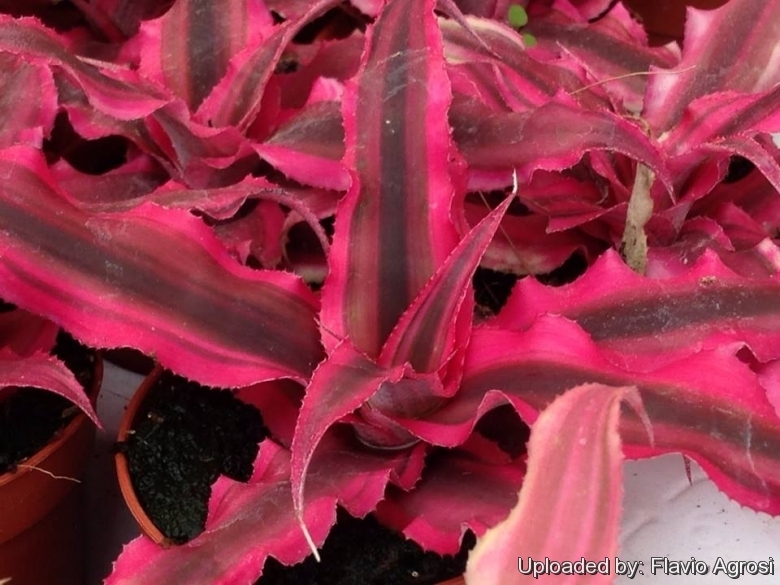 Description: Cryptanthus are unique in that they only grow terrestrially as opposed to many other bromeliads that can grow mounted on a substrate. Cryptanthus are commonly known as Earth Stars, a name they received because of the shape of their foliage. Cryptanthus 'Ruby Star' is a spectacular cultivar with incredible, brilliant red foliage from the centre of the rosette all the way to the leaf-tips. The centre of the leaves also have a vertical, dark bronze to maroon stripe running the length of the leaf. The leaves are rippled around the edges and have small, fine spines. Rosettes are small nearly identical to 'Ruby' in conformation, leaf shape and undulation but no black leaf borders. The plant requires bright indirect light for the best colour. Mature size:** 7 cm tall 15 cm across. 1) Wikipedia contributors. "Cryptanthus." Wikipedia, The Free Encyclopedia. Wikipedia, The Free Encyclopedia, 1 Aug. 2014. Web. 9 Nov. 2014. 2) Melanie Dearringer “Cryptanthus or Earth Stars:Care and Culture, Classification” in: bromeliads.info. <http://www.bromeliads.info/cryptanthus-earth-stars> Web. 9 Nov. 2014. 3) Melanie Dearringer “The Best Red Bromeliads for Holiday Decorating” <http://www.bromeliads.info/the-best-red-bromeliads-for-holiday-decorating/> bromeliads.info. Web. 9 Nov. 2014. 4) Cryptanthus Society “How to grow Cryptanthus the dazzling Earth Stars” <http://fcbs.org/cryptanthussociety/CS_CultureSheet.pdf> Web. 9 Nov. 2014. Cultivation and Propagation: Cryptanthus 'Ruby Star' is a bromelid of remarkable ornamental value, and of great landscape effect, due to its very bright red foliage that adding a purple splash of colour to the garden. In garden situations it is easily grown as a terrestrial or container plant, it is very durable and seems to thrive without a great deal of care. It makes also excellent houseplants. Remember to keep the plant moist and in humid conditions. This is especially important when you use central heat or air conditioning as the moving air has a tendency to be drier. Growing substrate: This bromeliad is typically grown in the ground in virtually any soil, but prefer free draining soil or in containers filled with very aerated, gravel/rock and rich of organic substance substrata. Perfect drainage is a must. It is easily transplanted; however, it can also be grown in a garden bed, where it will form big specimens. Exposition: In the garden it grow well in full sun sun with just some shelter to direct mid-day sun in hot summer climates, but will also grows equally well in half sun where it will get morning sun. Full sun produces the best leaf colour and form, even with the green types. In tropical conditions some burning may occur in the middle of summer, but in temperate climates burning is rare, unless the plants have not been acclimatised before planting out. Too much shade will cause leaves to look thin and leggy. Watering: It enjoys constant moisture from rain or sprinkler and with high local humidity. In summer the plants grow best with high humidity. In summer if the temperatures are over the 18°C, some distilled water can be left in the central cavity formed by the rosette of leaves, renewing it frequently to avoid the formation of a mosquito larvae nest, whilst with lower temperatures and in winter it is better to leave it dry, thus avoiding possible rottenness. In presence of dry air and high temperatures, humidity can be incremented with nebulisations, whilst in winter with low temperatures it is better to leave it quite dry for avoiding possible rottenness. Feeding: Fertilize your Earth Star to encourage growth, repot pups, and continue enjoying your Cryptanthus for years to come! Salt aerosol hardiness: They are completely resistant to salt spray and wind, coping with near cyclone conditions even when planted in an exposed position. Hardiness: It must be grown in a frost-free situation in open air in in the tropical and humid subtropical climates, with temperatures which it is good to keep over the 10° C, best 20-24°C. However its cultivation can be tried also in the warm temperate climates, in sheltered position, as it is surprisingly cold hardy, coping with up to frosts of several degrees. However young plants may be frost burnt. Winter hardy to USDA Zones (9b-)10-11. North of Zone 10 this bromeliad is usually grown in containers that must be overwintered indoors. Pest & diseases: No serious insect or disease problems. Watch for aphids, thrips and scale. It is susceptible to mosquitos that will sometimes breed in the pools of water that are trapped between the leaves. Mealybugs infestations are also a frequent problem. Rot may develop if soil is kept too moist. Tip: Remove older plant crown when it begins to fade. Use: The plant can be cultivated When planted against plants with darker foliage, it really stands out. Propagation: From pups and tissue culture. When the flower fades, pups appear from axillary gemmae between the leaves near the base of the plants. The offsets can be detached and repotted. Be sure to provide high humidity for a month after propagating the offsets. The wide scale reproduction for commercial purposes is done by micro-propagation. Of course tissue culture and pup production, being vegetative, ensures that the plants will be the same colour as their mother. Tissue culture can produce unlimited numbers of plants, but even pup production is prolific.